I had a good crop day, even if I didn’t actually CROP. 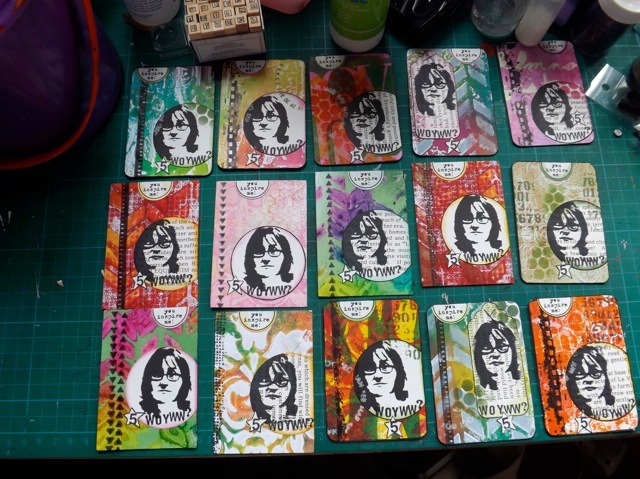 What I DID do was make a load of ATCs for the upcoming WOYWW crop and anniversary exchange. 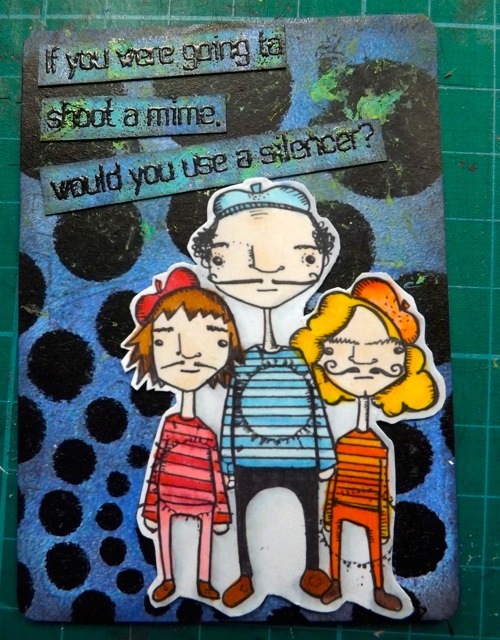 Now I know some people like to keep their ATCs under wraps, but this is the lot I did for the “extra” exchange. I’ll do a special one for the person above me exchange (or is it the person below? I forget, but am sure Julia will specify again) so not worried about showing these. I figure most of the exchange will come AT the WOYWW crop so people will see them anyway. 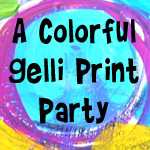 When trying to decide on the design, I figured I should use the techniques that I am “known” for – that means Gelli prints and digital manipulation, I guess would be the best way to say it. 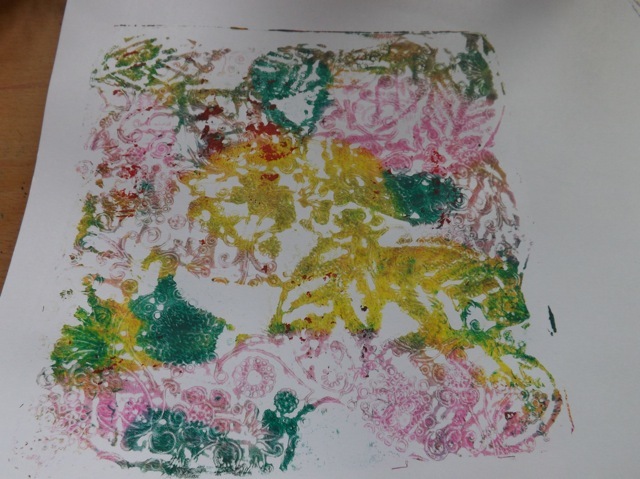 So these all have Gelli prints as the base, some printed bits, and the image of me that I manipulated and then carved on an eraser to make a stamp. Not too bad in the end. 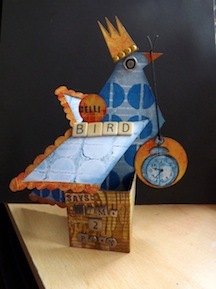 Not as perfect an image as the manipulated photo (and some of the ATCs do have a printed version on them instead of a stamped one, just for variety) but not too bad at all. Can you tell the difference from a distance? A few need final touches but overall the selection is done! And all of them are backed with my ATC back printables from yesterday so now it’s just the handwritten bits I need to add! 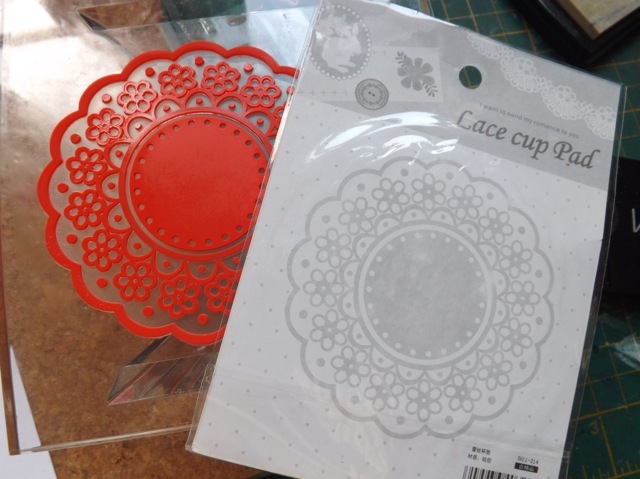 I was also super excited as Julia and I popped out to do some errands and stopped in (cause I begged) to Kraft Krazy – I wanted a few Kaisercraft stamps) and she still had some of the Clearly Better stamp pads! I have the brown and black already but added a Graphite one to my collection. 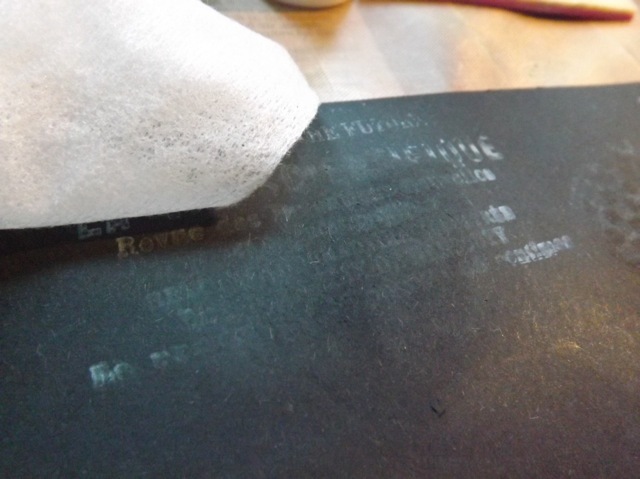 They really ARE better for clear stamps. I’m not sure they are still being made anymore but if you find them, grab them. 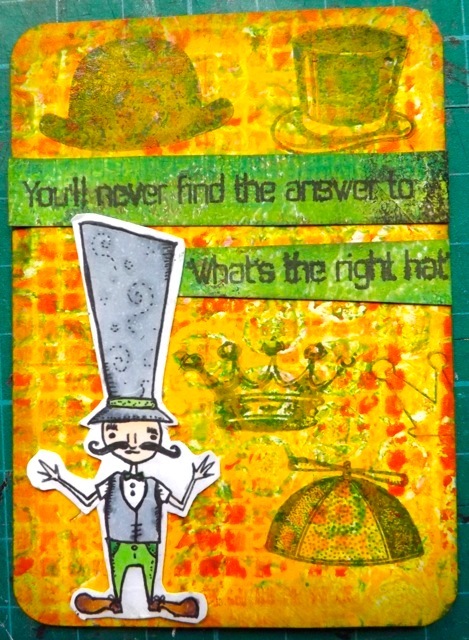 And I got two sets of border stamps I adore – used on the ATCs, I’m sure you will note. Ah, now I am seeing the sun too, so best get that laundry done and hung out to dry…. 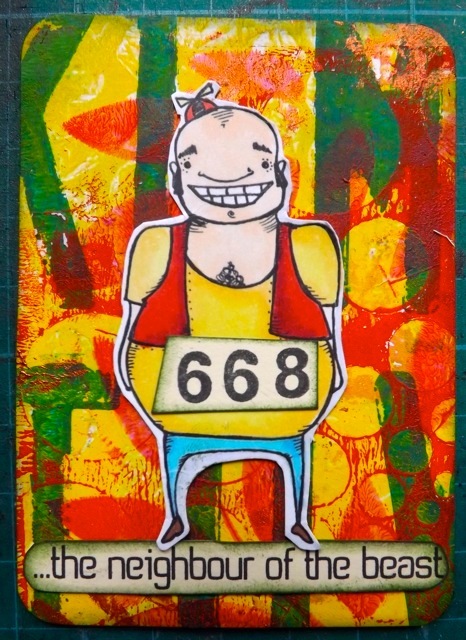 Categories: ATCs | Tags: ATCs, stamps | Permalink. 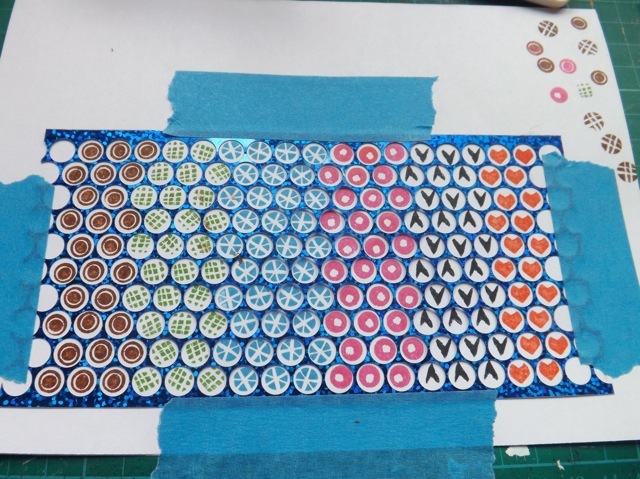 Thinking about my WOYWW ATCs …. So I am FINALLY getting to go to a crop tomorrow. I’ve had a run of things getting in the way (and one month it was cancelled) so really happy this week it looks like all systems are GO! I don’t want to dar a load of stuff with me, and with the WOYWW crop and anniversary ATC exchange looming, I thought that might be a perfect way to spend the day. I wanted to do something a bit interesting this year and had the idea to make my ATCs with something unique and personal. And face it, aren’t all we WOYWWers curious to see not just the desks of our cross-the-world community members but maybe sometimes keen to see THEM? 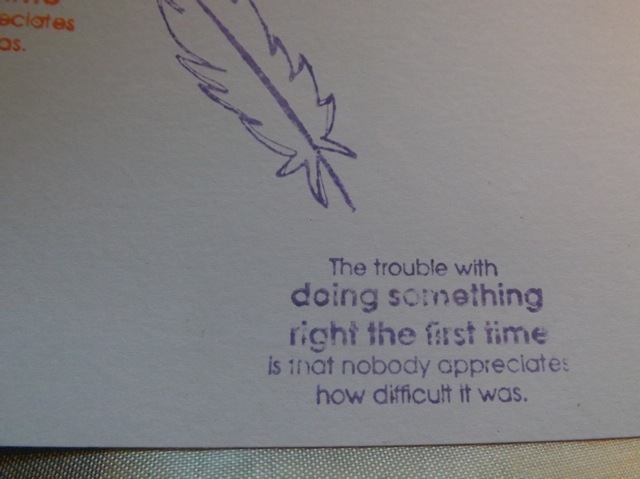 Or maybe that’s just me… In any case, after carving the little eraser tip stamps I thought, as I so often do, I wonder if…? 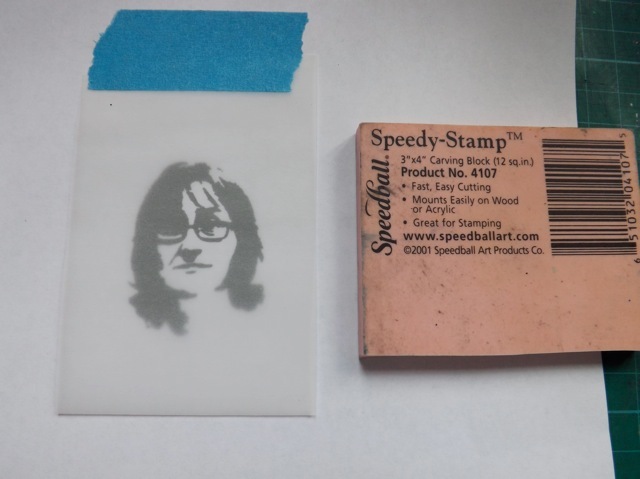 For my first experiment I took that stencil image from one of my AJ pages and reduced him greatly then transferred him to a 25p eraser from the grocery store. They are NOT good. Oh, they carve like a dream but they are convex, slightly. 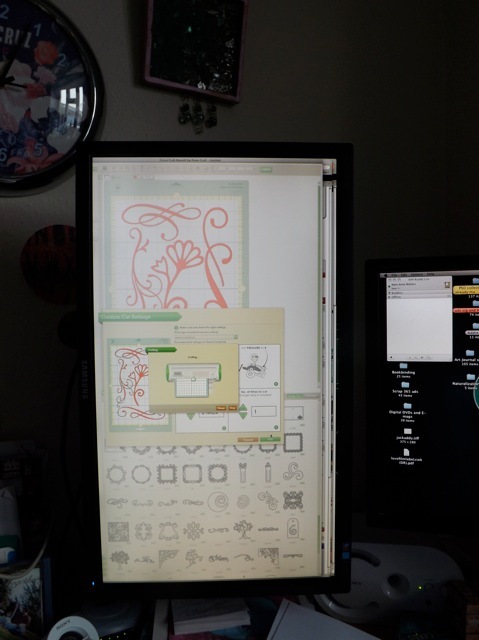 Perfect if you want a small image in the middle, because the downward sloping sides keep the edges from printing without having to carve them, but NOT good if you want to make use of the whole area. Maybe you can see that the side didn’t print as clearly as I would have liked. You can’t see it with noting to give any perspective, but the face is approx. 1 inch x 1 3/4 inches. 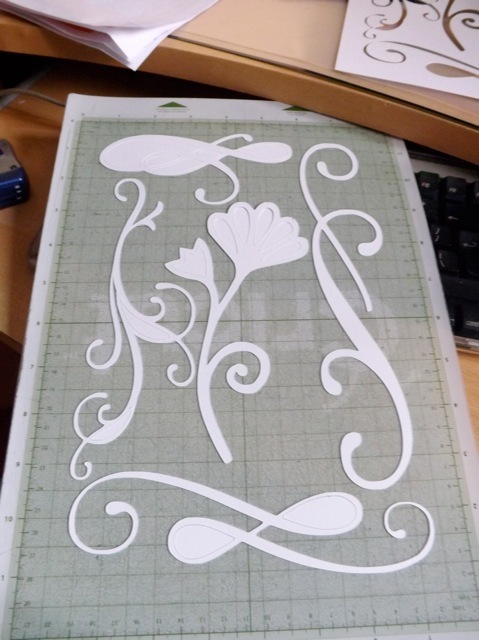 Not big at all, I also only have ONE carving tool, that I got in a Club Scrap kit, OMG, must be 10 + year ago. 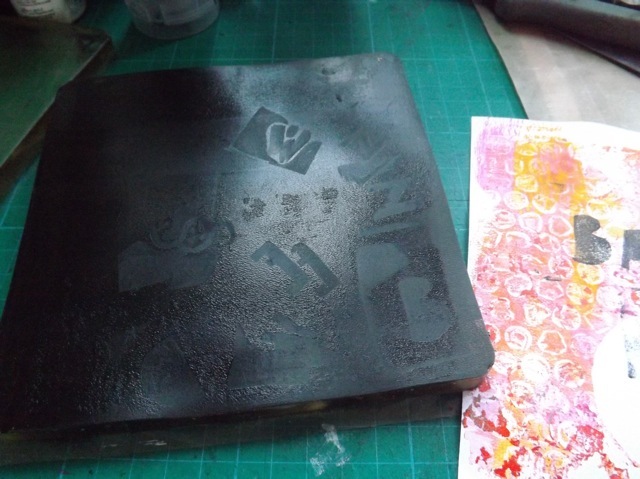 I also have ONE Speedball carving block that came with it (actually only a piece of it) so I wasn’t keen to dive in and risk ruining it without at least a LITTLE practice. I think it turned out pretty good. So then I got a slightly more up to date photo of me (actually from my passport about a year back, so before I lost like 40 lbs. 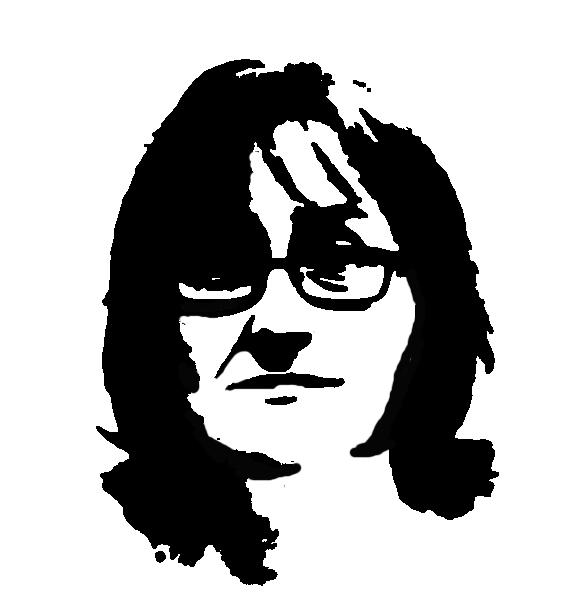 but still a reasonable representation, and scanned that, used PSE to posterize it then used the Sketch>stamp filter to simplify it for carving at such a tiny size. I maybe can get two tries out of what I have left…and LOL! I just notice in the photo the date is 2001. I am a hoarder, clearly. I am fairly sure I am not going to get even as much detail as you can see, but I hope I can get something that looks at least a bit like me. 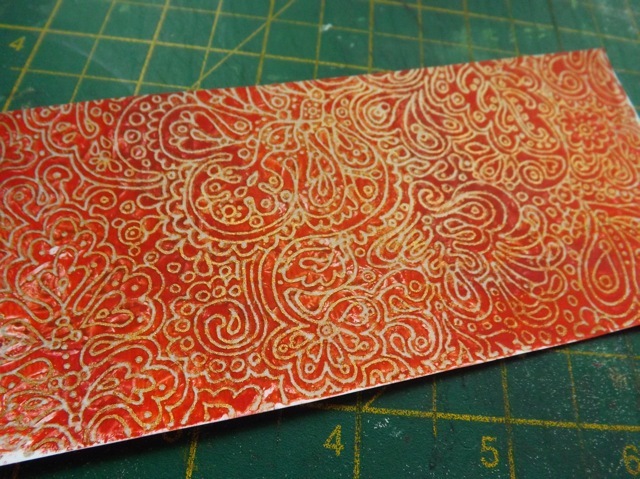 And THAT will form, at least in part, the basis of my ATCs! Of course you’ll have to wait till week 260 (I think that’s right) before you see the rest of it. I have an idea that may work, but that I’m keeping under my hat for now. 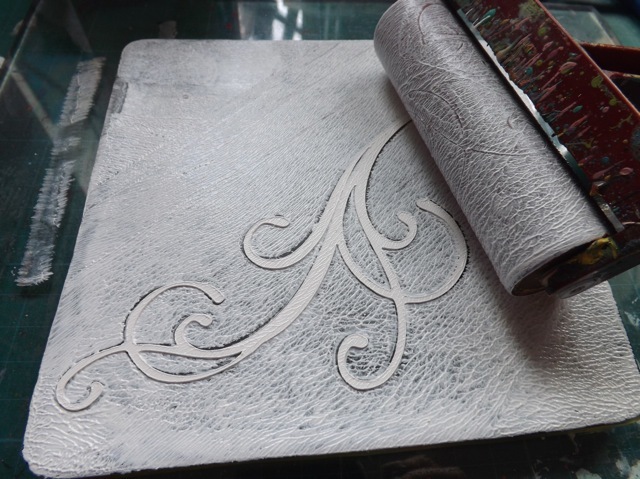 I might just read up a little on stamp carving to get some tips…wish me luck. 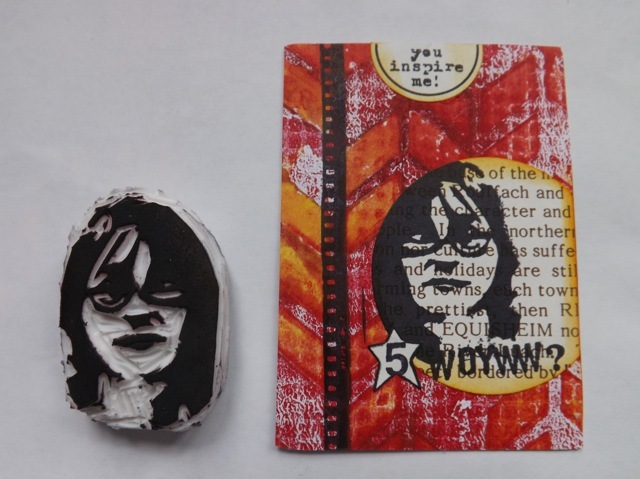 Categories: ATCs, Uncategorized, WOYWW | Tags: ATCs, stamps, WOYWW | Permalink. another one of THOSE posts…. Happy Mother’s Day to the UK Mum’s. Lucky me – I get TWO days ’cause I make the family treat me as both a UK and then as a USA Mom for THAT Mother’s day LOL! Funnily enough when DS came home from Uni for the weekend, with his backpack crammed full of a weeks worth of dirty laundry, I commented to him that the last thing I wanted to do on Mother’s Day was sorting out his laundry. He retorted quickly that he knew nothing would give me greater pleasure, which did make me laugh. And he’s probably right – I do love tending to my family. The cooking, the cleaning, the ministering to them when they are ill (as, actually, DD is at the moment, poor little sausage) is something I want to do for them ’cause I love them. But then I do love my blogging too, so I took a moment during the current wash cycle to snap a few photos of stuff that happens to be on my desk at the moment. Maybe there will be something useful here for you, even if the photos aren’t wildly exciting. 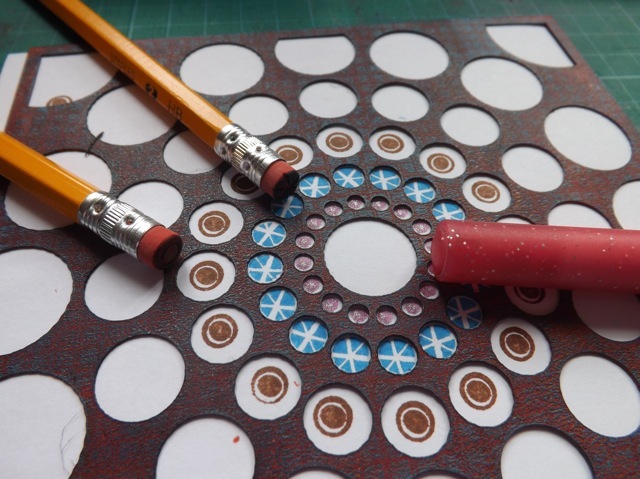 First, I was looking at an article in Craft Stamper about pencil eraser carved stamps. A few months back I saw an Interweave video about making stamps (maybe it was an E-book free download, I really can’t recall at the moment) and had carved a super simple stamp from one of the many UK pencils with useless erasers (I don’t know why but they are so hard and not fit for purpose, not like the US #2 pencils I recall from my childhood) we have kicking around. It was handy in my pen pot on my desk so I grabbed it. 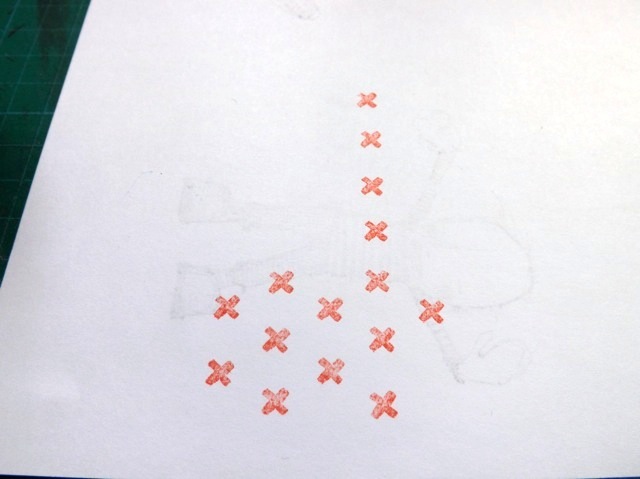 The article suggests drawing a grid, which you then erase, in order to stamp the tiny images in an orderly fashion. 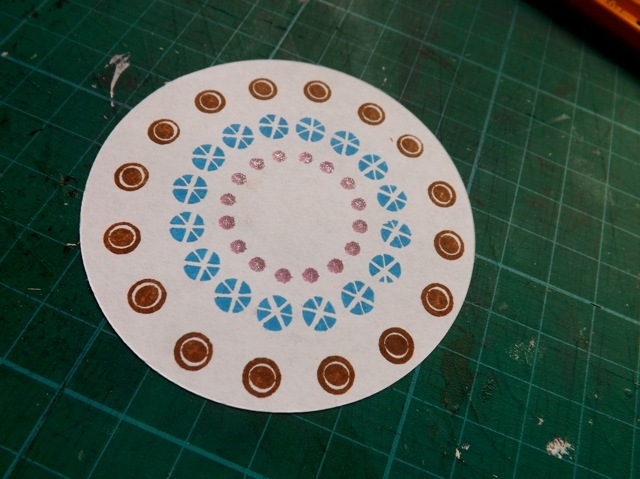 I had a quick little stamp of the +/x that I had carved (I thought I could use it to mimic cross-stitch stitching but never really used it) and saw that with this design the problem wasn’t just with laying out the stamped images neatly, but keeping the round pencil properly oriented. 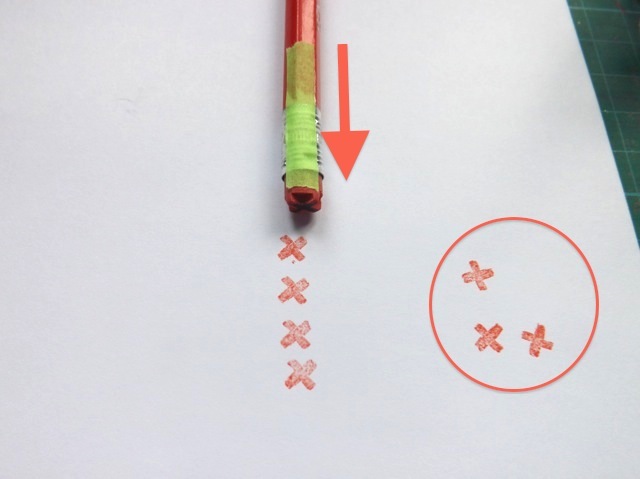 Just adding a thin strip of Washi tape to the barrel of the pencil allows me to line it up to get the + or the X and keep them straight. A Sharpie line would work as well. 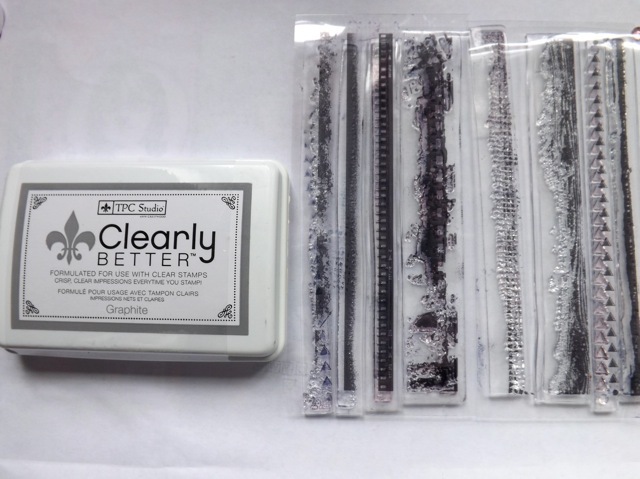 The I thought about the whole grid thing – well, I hate drawing then erasing. Even light pencil lines show up sometimes. 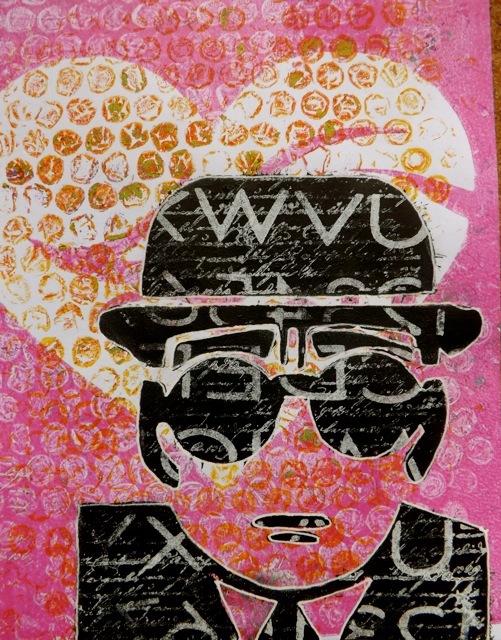 But then I spied a stencil off to the side. Bingo. 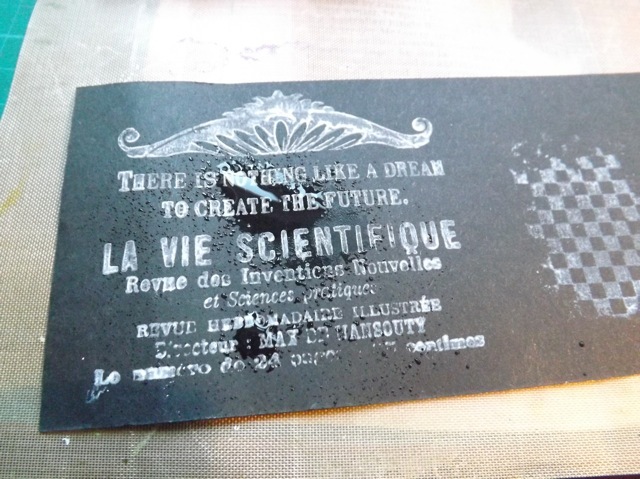 I just stamped the little image thru the stencil. 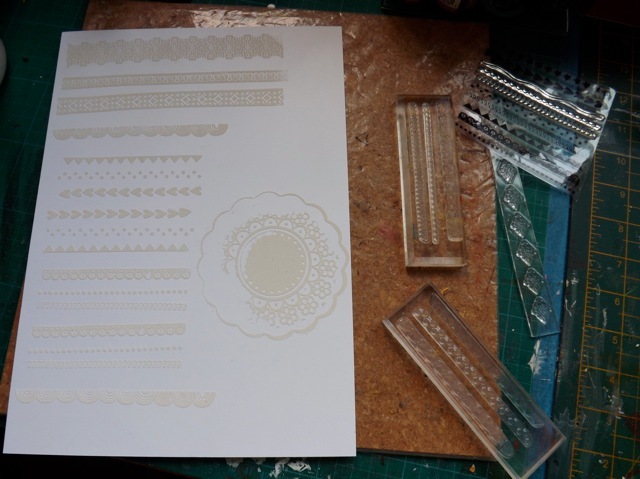 Depending on the stencil and how you oriented it you could get straight lines or staggered ones or even a circle. But you can see it works well. 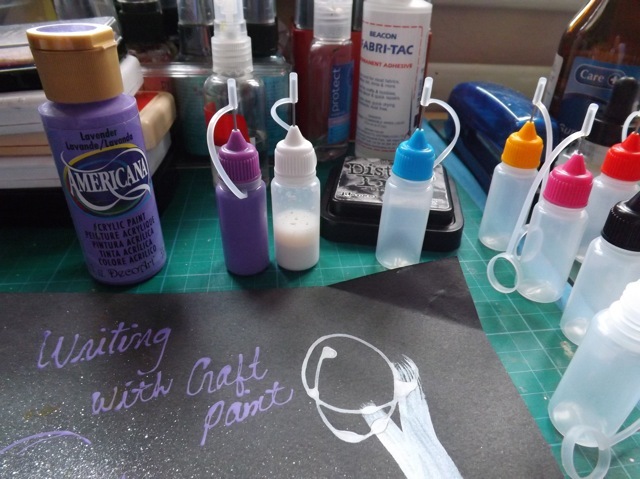 I also have been itching to get some needle-tip bottles, for writing with acrylic paint. I wanted some that were small, and a lot of them. 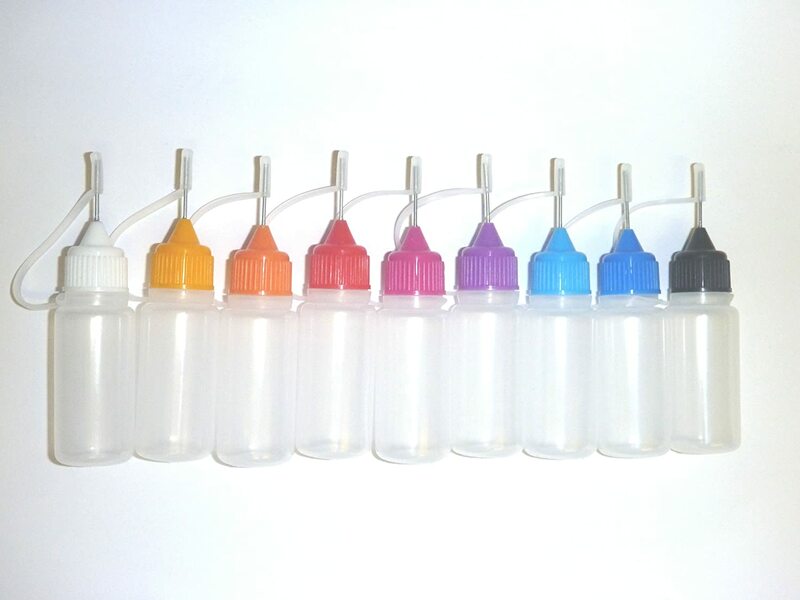 I wanted proper needle-tip bottles, not just fine-tip ones. 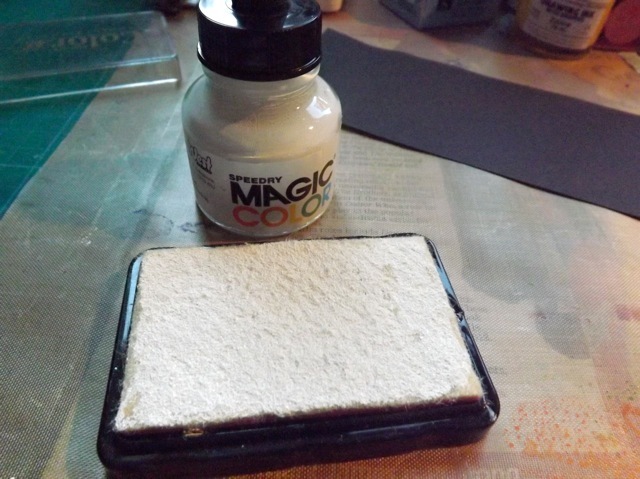 I found them for what I thought was a pretty good price, and they are quite small, so if I wanted to change colours and rinse one out I wouldn’t be wasting a lot of paint. 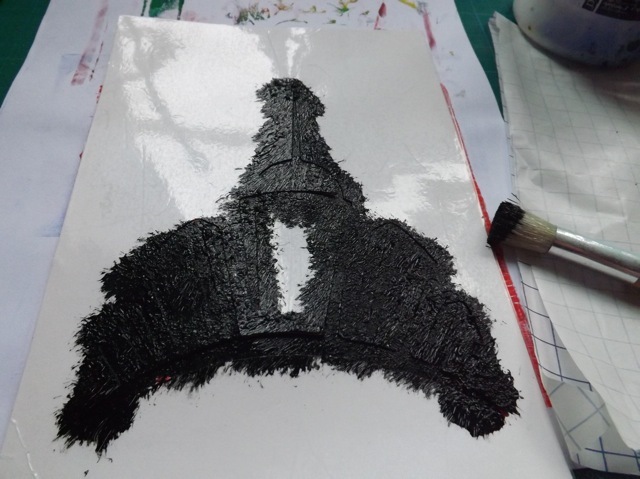 I tried both filling with plain old craft paint, which is nice and thin and flows perfectly, and mixing heavy-bodies paint with water. That worked less well, but I think I need to play with the ratio of paint to water. 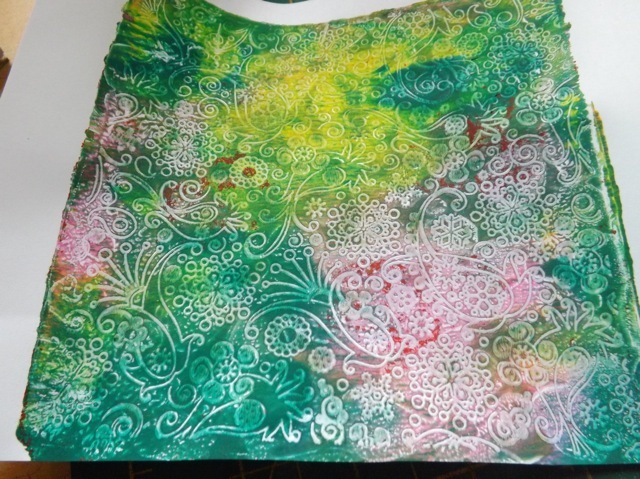 The paint and water mix gives an interesting effect. But those are all thing to play with more on another day. I can hear the washer spin cycle has just stopped so …. 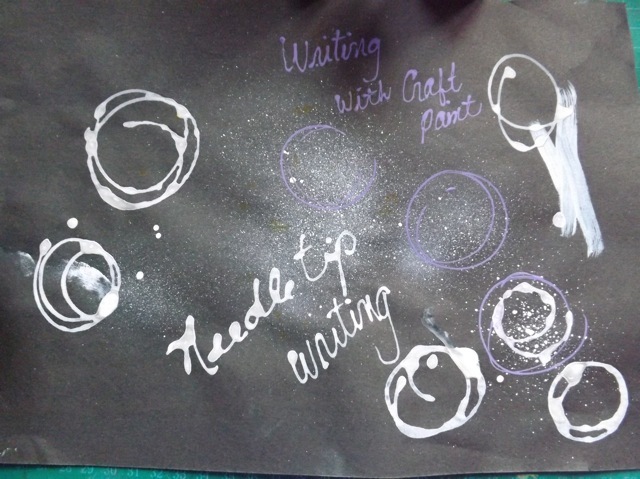 Categories: musings, Uncategorized | Tags: art techniques, stamps | Permalink. NOTE: Just to add a link for you. The font I used is called Art Post and is free to download from daFont. OK, so I know that I often do things that not everyone would bother with. There are a ton of great alphabet stamp sets out there, and generally I think people are inclined to just buy one. 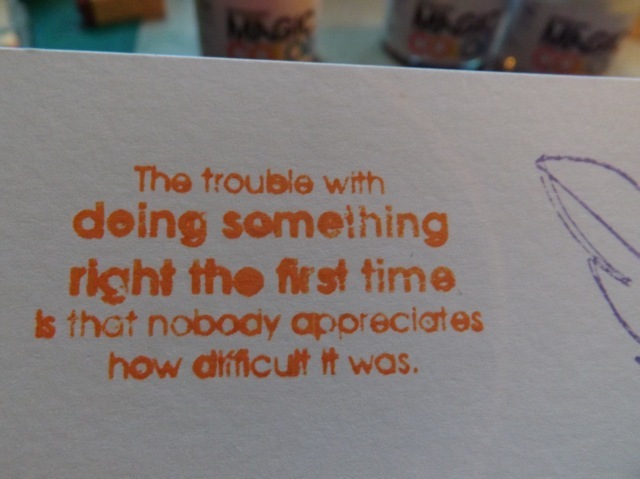 I often find fonts that I LOVE, would buy a stamp set from that font it one was available, but it isn’t. 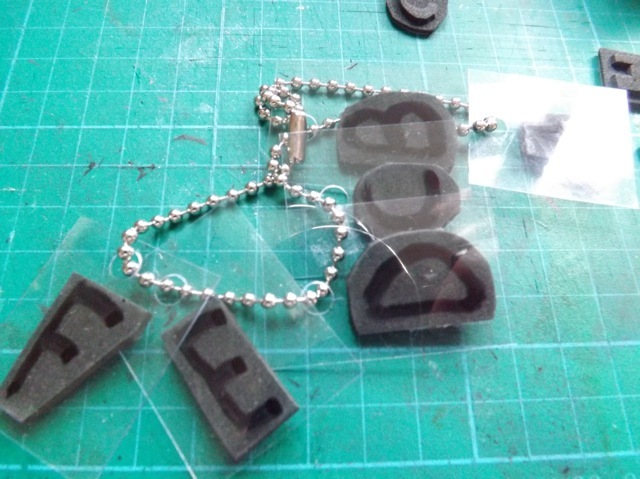 What has held me back from making my own is either the font is too intricate to cut from fun foam or I can’t imagine a good way to store the stamps. 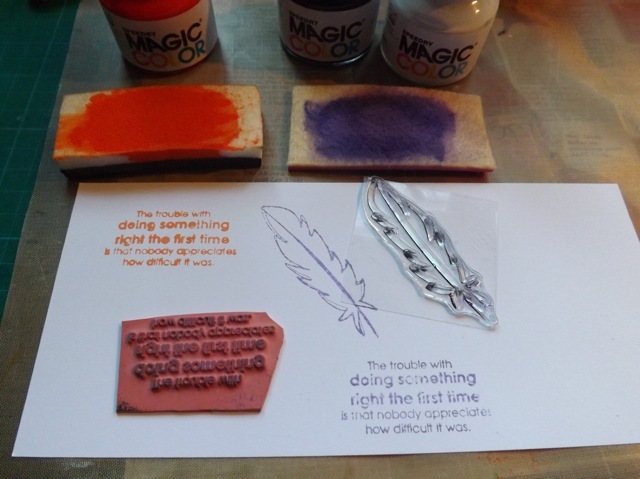 The thought of a box of loose stamps isn’t really appealing (although I do have boxes of foam stamps from back in the day that I still use, I really don’t need MORE boxes of them) so I usually resort to some other method – like printing the text and using it that way. Today I had a lightbulb moment. 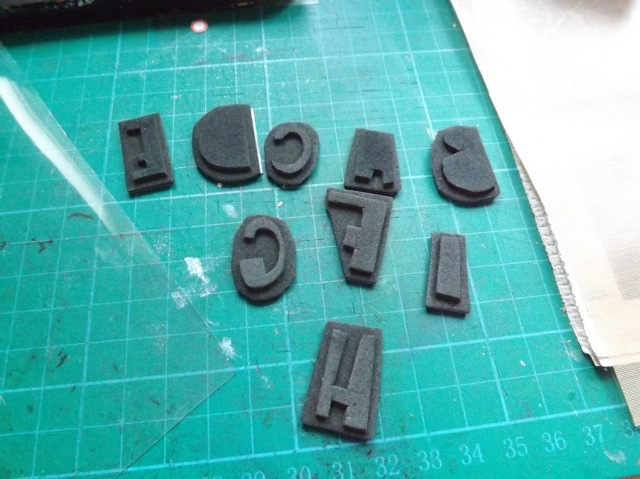 I printed the font I used yesterday for the word block (Art Post Black) and cut the letters from fun foam. 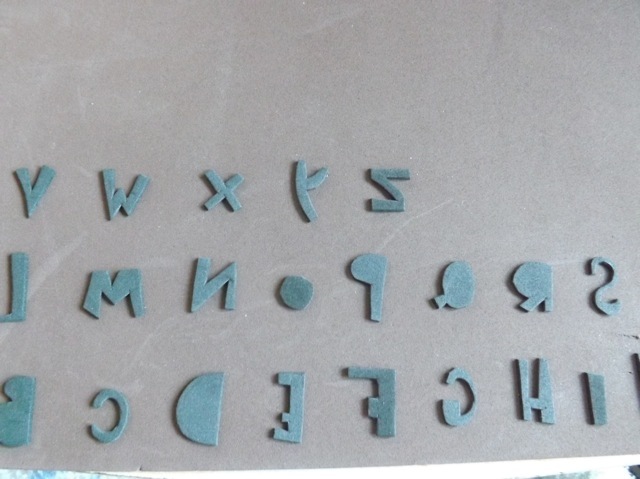 This is an easy font to cut, due to the blocky nature of it and the fact there are no “open bits” to the letters. It’s a perfect task for doing in front of the TV or while listening to Radio 4. 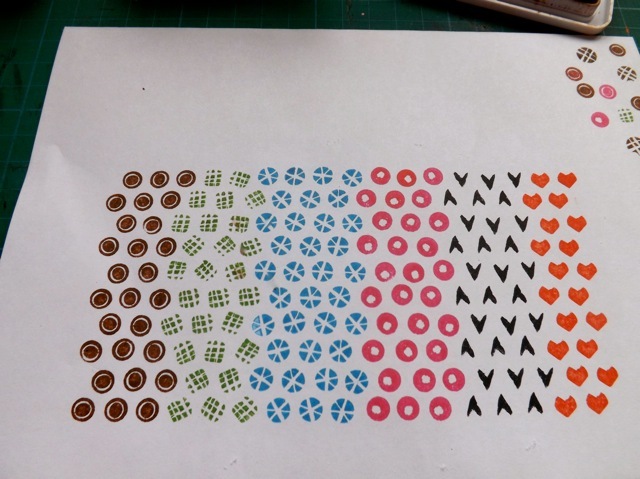 So long as you print the font the right way around then mount the print to the paper covering over the sticky side, then letters will be the right way round for mounting. 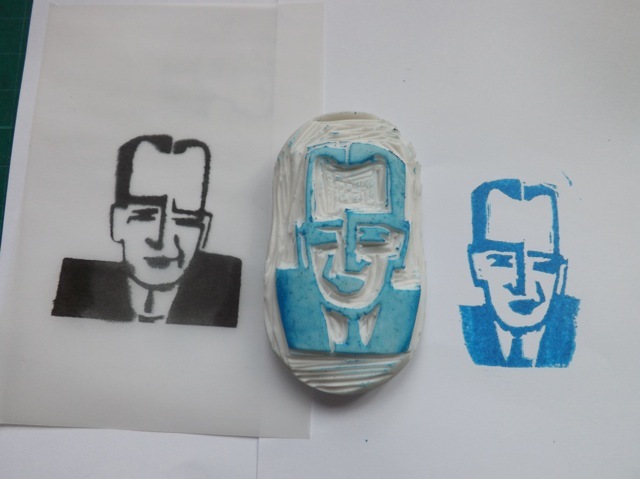 I first thought they would be fine stuck to another but of foam, as it was quick and dirty, but DIRTY is the right word – the flimsy foam and the fact the stamps weren’t very thick meant getting a good impression was tricky. Even if I curved them a little I still got paint on the surround – plus the opaque back made it hard to place the stamp accurately. 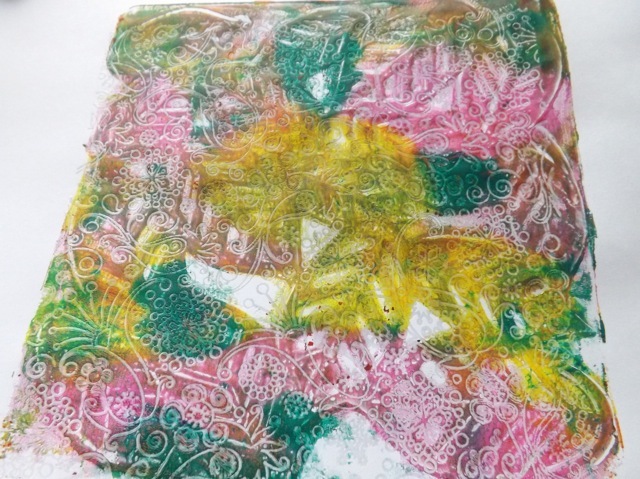 Can you see that I often use my 6 x 6 Gelli pate as a stamp pad? 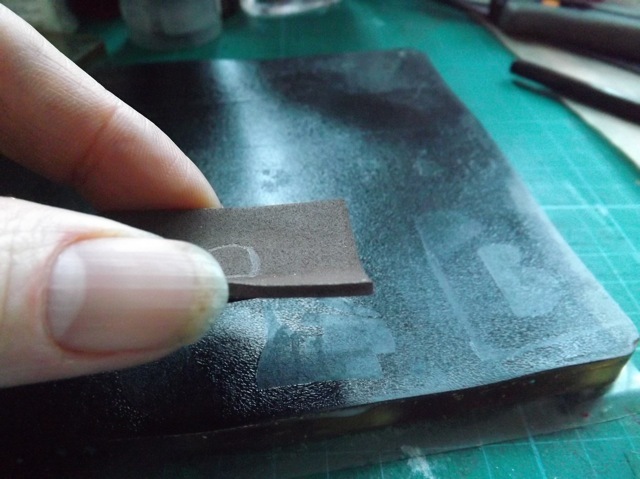 a little medium added to the paint lets it stay open longer so it doesn’t dry out too much. So two problems to solve. 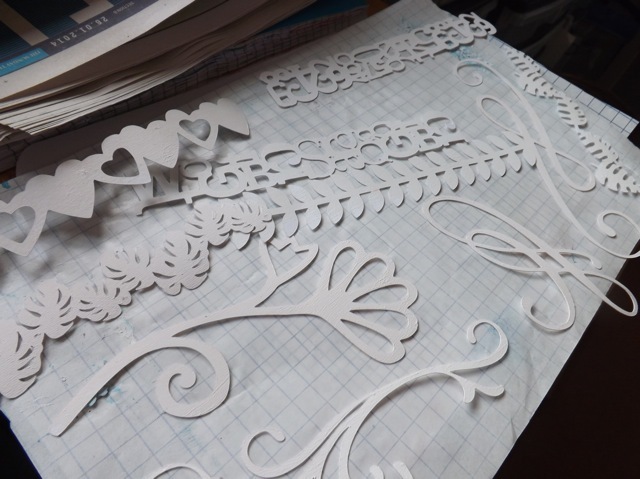 The first issue – the fact the fun foam is fairly thin – was solved by sticking the cut letters to another sheet of fun foam and doing a rough cut around them. 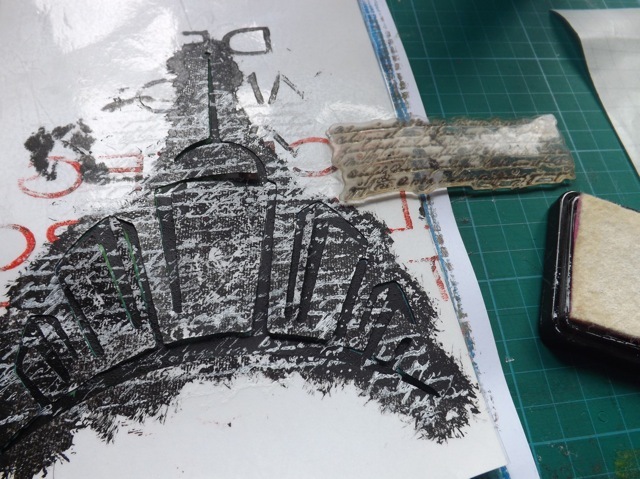 It’s not necessary to cut the letters precisely – the second layer is more like a cushion, and as this is a grungy sort of font a tiny bit of overstamping is OK with me, but not as much as you see above! 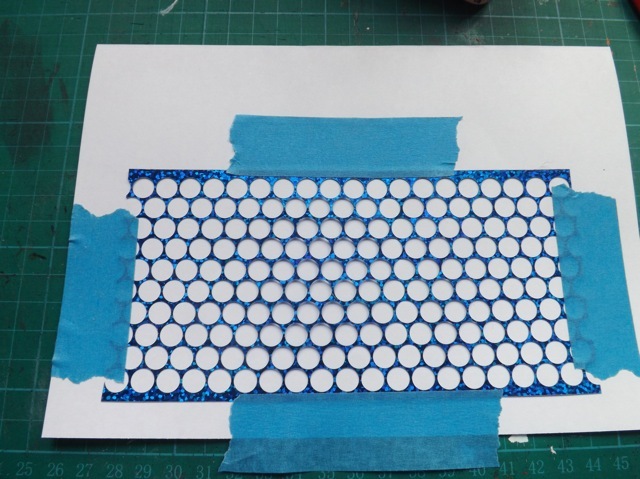 I took a piece of clear plastic packaging and using the grid on my mat, stuck the foam stamps to that – just to make sure they were straight – and cut them plastic into rectangles. The key is to leave a good space at the top (or bottom) cause the solution to the storage issue is simple, effective, and tidy. 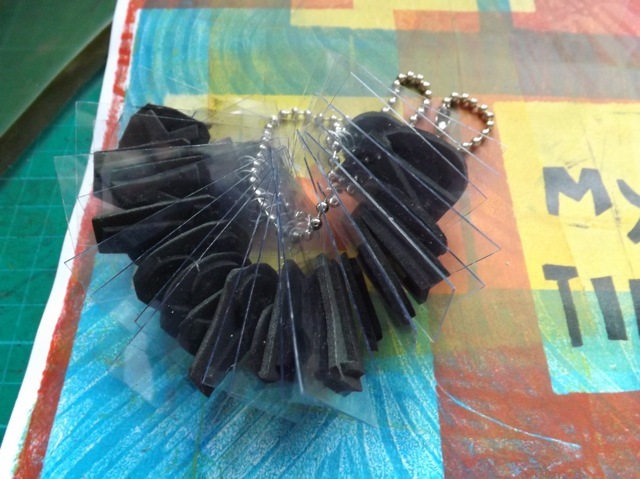 Punch a hole in the plastic – I just used a standard hole punch – and thread it on a ball chain! I used a longer chain that was strictly needed because I found I could load them on in alphabetical order and stamp with them without taking them off the chain that way. I did write the letter on the back of the plastic with a Sharpie (and for any future sets I think I might use something other than black foam, but that was what I had on hand) just so there was no way I would mistake the top for the bottom and stamp an upside down letter. 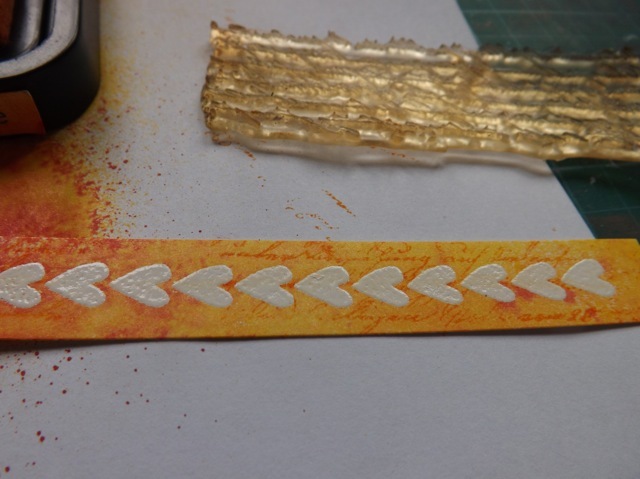 And you can see the stamping is MUCH improved, bit in neatness and placement. 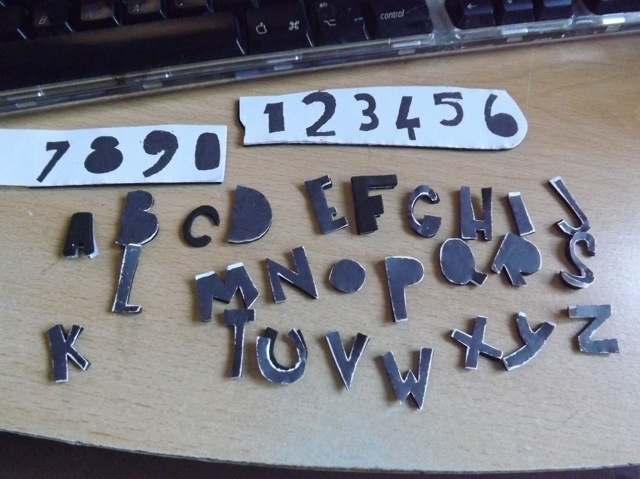 So now I have a custom stamp set of a font I love, that cost me the price of two sheets of craft foam, a bit of rubbish plastic, and no more than an hour of my time. Totally worth doing. I still have the numbers to do – and one of the advantages of this is you do get both letters AND numbers, cause I hate it when I use a stamp set and don’t have the numbers to match – and I might do a couple of words in a bigger point size (this is 64 pt) just for fun. And I have a couple of other fonts I am loving at the moment that might work well for this … and I have about 3 weeks of EastEnders to catch up on so that sounds like a match made in heaven…. 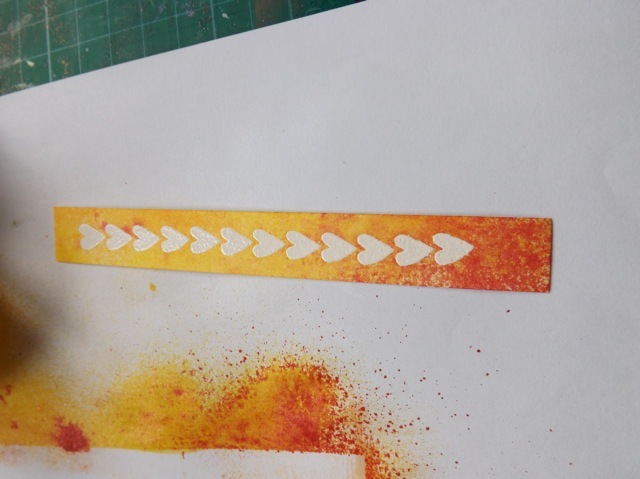 Categories: stamping, tutorial | Tags: how-to, stamps | Permalink. This is decidedly weird. Sometimes, I have an idea and it’s more about seeing if it works and then trying to figure out how to USE the idea in the most effective way. I tend to share even the pure experiments before I actually work out the use of them. This is one of those posts LOL! 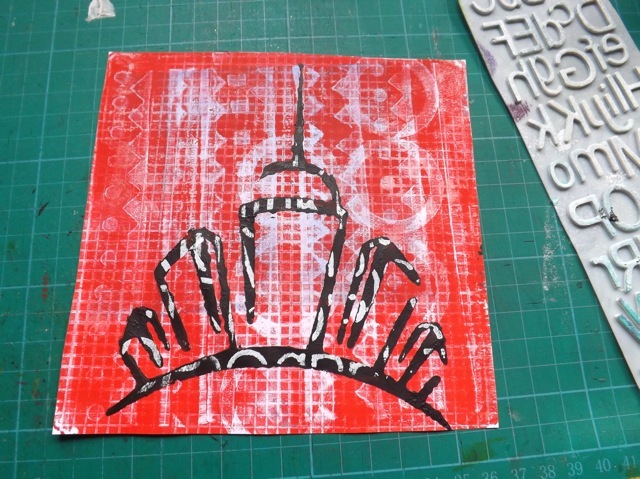 I have a couple of 6 x 6 inch background stamps so that made sense with the 6 x 6 inch plate. 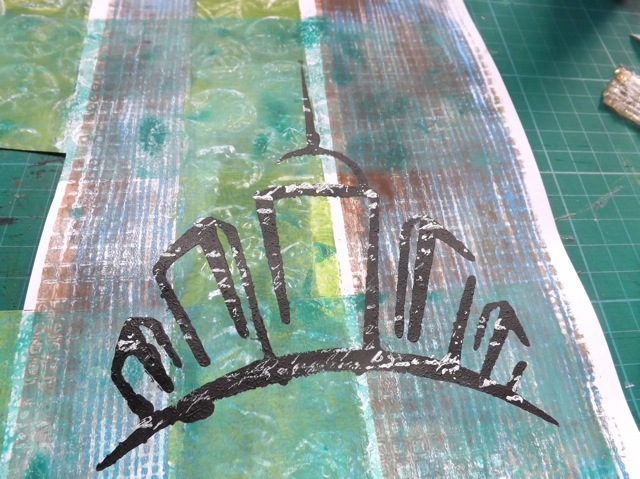 Ironing it off worked, sort of, but my choice of stamp and Gelli print combo wasn’t the best – you can barely see the Gelli part. 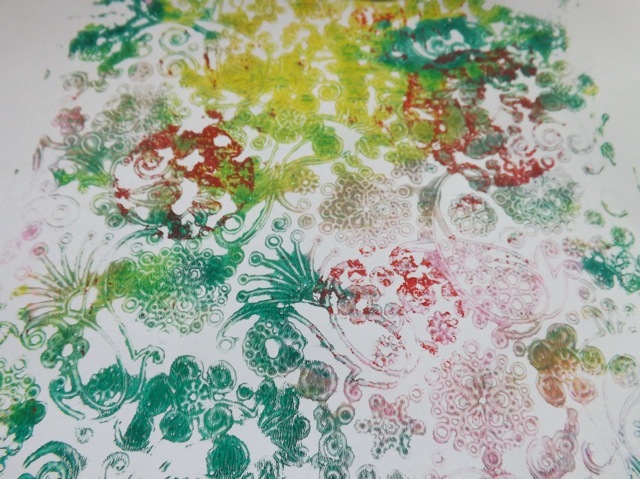 But the ghost print was interesting. 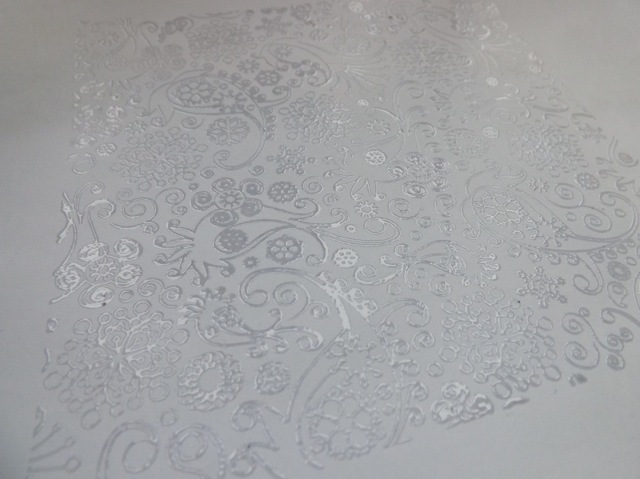 where the embossing touched the plate it sort of impressed the pattern of the embossing into it and left it, much like it does with a stencil ghost print! The differences between the two are much more apparent in real life! 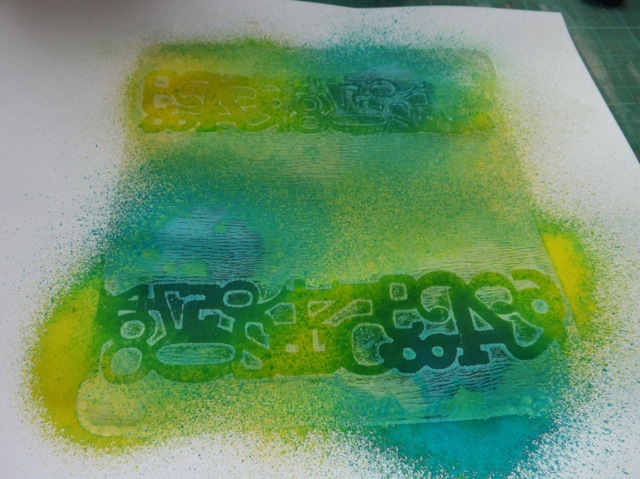 I did try, but didn’t photograph, a couple of text circles, embossed, with a print behind. 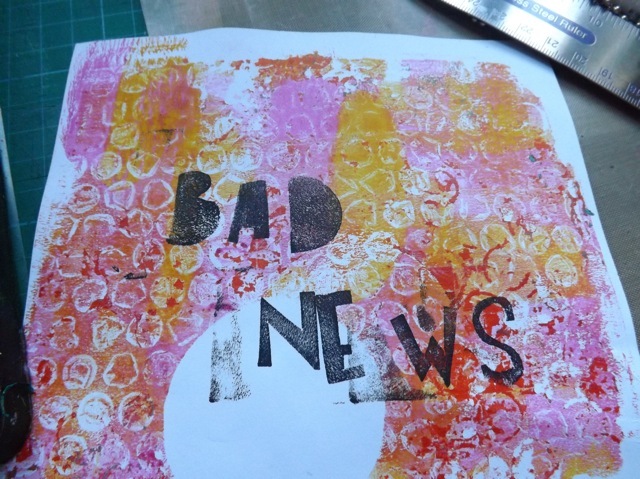 Again, it was the combination of the embossed bit and the Gelli print that left me lukewarm. 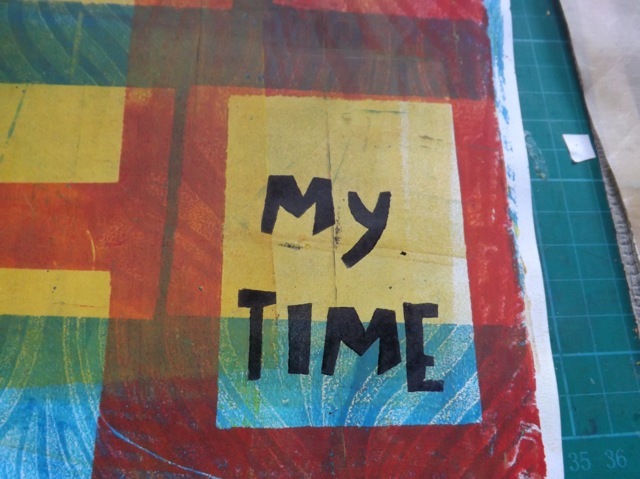 I think more experimentation is clearly needed – as with most things, I like to try a LOT of stuff then try to work out a set of “rules” that will give me the greatest chance of success. 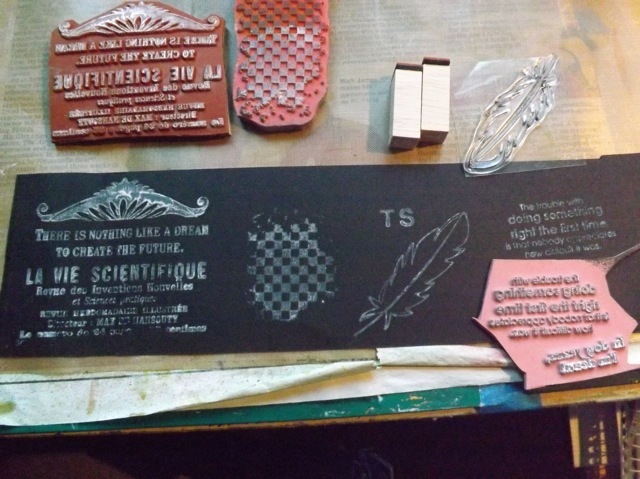 So, single images v overall stamp&embossing? 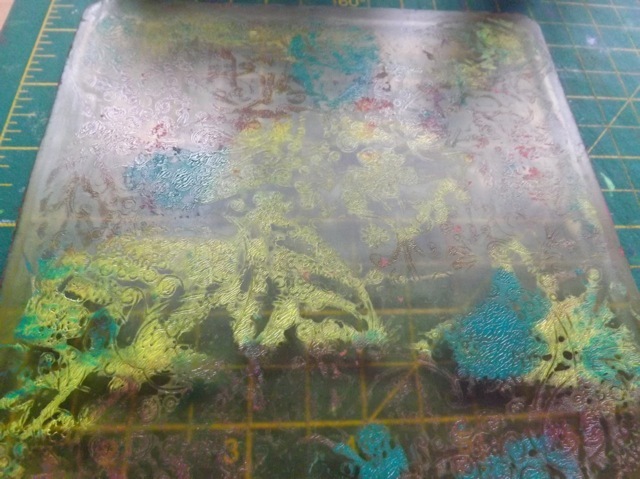 Small scale Gelli patterns v large-scale? Open areas v overall texture? These are the questions I need to answer! Once I get a firm grip on how the combos are likely to work I will then know in future what will give me the effect I like. 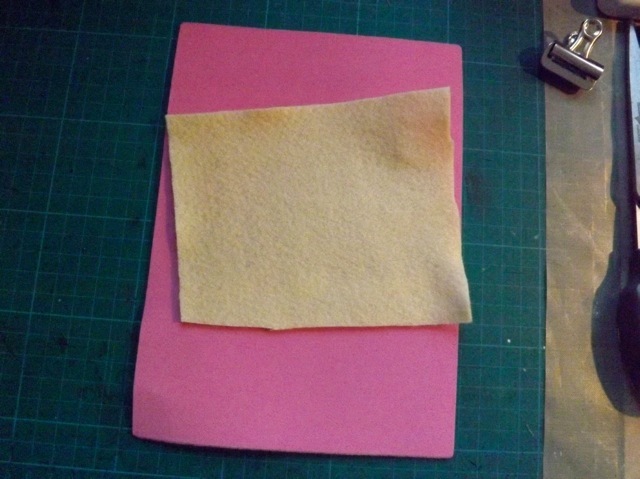 I am also curious about embossing on deli paper and what effect THAT might give – and if the embossing, if left in place and not ironed off, will tear, for collage work, for example, of if breaking the surface tension (is that the right term?) 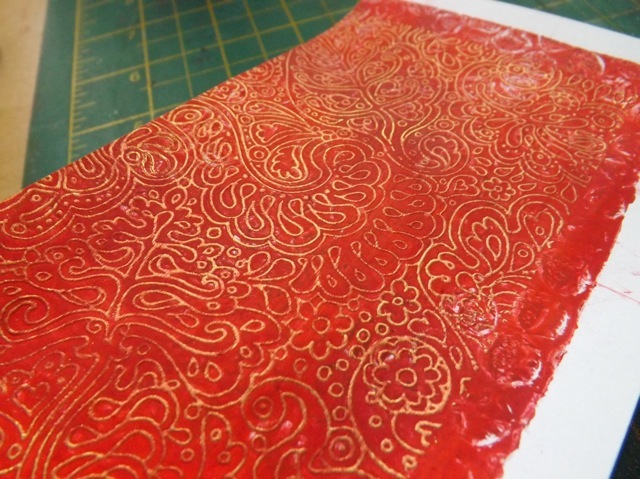 of the embossing will cause it to chip and flake? So many ideas, so little time to play….So if you have a play be sure to report back your findings. I’ll be very curious to know what your experiments produce! 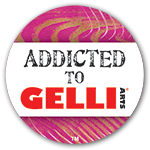 Categories: art, Gelli plate monoprints, stamping | Tags: Gelli plate, stamps | Permalink.